2 Cool Muscle Building Ebooks Absolutely FREE! 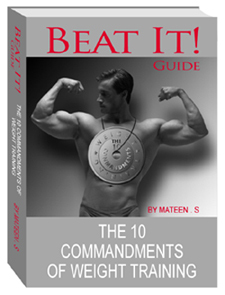 The Only Weight Training Ebooks that you will ever need to Build Quality Muscle and Gain Weight for a Lean Muscular Body. Its a 29$ Value but yours FREE today. Just sign up to the Beat It! Newsletter on the below and I will send you the ebook. I promise to use it only to send you Beat It ! The Ultimate Weight Training & Muscle Building Ezine. Its a 29$ Value but yours FREE today. Just sign up to the Beat It! Newsletter on the right and I will send you the ebook. Having spent the last 10 years of my life training with Weights, reading every book on Weight Training, Fat Burning and Bodybuilding I could get my hands on to I feel its my duty to help people like you with correct Weight Training methods. The website will show you the timeless Weight Training tips but the advances in Bodybuilding just keep coming up and I will cover them in the Ezine. No need for you to read all the garbage. No need for you to keep up with the Exercise and Diet advances, we do it for you. Just Subscribe using the form below and I will send you this Amazing Ebook Free. Remember its only available for ExerciseGoals.com Subscribers.